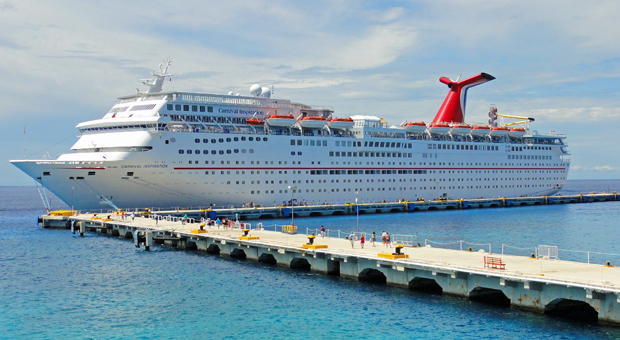 There were 4 days at sea along with two days at port; making stops in the Grand Cayman and Cozumel, Mexico. Before booking the trip, I checked out reviews on Cruise Critic. Of the 442 reviews this boat has, 75% were positive. Here are some highlights of my experience on the ship. Food: The food was plentiful (as expected) and tasty. The buffet was very good and the evening dining hall had a good variety of food. We had a table for four all to ourselves the entire week, so that was a treat! "After hours" there is a 24 hour pizza bar and ice-cream station, and the room service was quick. I wouldn't classify this ship as a culinary dream, but it certainly was ample. Drinks: The wait staff were very attentive and it was never a long wait to get a drink. As expected, the drinks were expensive. But if you stick to lemonade, water, tea, juice, etc, you don't need to spend extra to stay hydrated. If you're planning on drinking a lot, you might want to get one of their drink packages. You can save on cocktails, wine, and soda by purchasing these. There are a lot of rules and fine print, so read up before you go. Pools: I was not impressed by the swimming pools on the ship. There is one main pool with a water slide going into it, which eats up some of the space. There were also a few whirlpool-sized swimming pools (with cool water) but not of the size for actual swimming. Deck Space: There were always plenty of lounge chairs available on deck. They didn't seem to have the usual "reserved chair" issues that many ships have. As the week went by, I think more people were hanging out inside so there were even more chairs available. Rooms: We had an ocean view room with two twin size beds converted to a king size. The noise from the ship was at reasonable levels and besides some noisy neighbors a couple of nights, there were no noise issues. The bathroom was sufficient and overall there were no issues with the room. Entertainment: Admittedly this trip was more about relaxing than it was the nightlife. But we did take in a few song and dance shows. While the theater is smaller than a lot of other boats, the entertainers were very talented and the shows were great. We also took in a few comedy shows, which were awesome. Just make sure that you're leaving the kids at home if you're going to an adults-only show. They aren't kidding when they say they're not family friendly! Time at Port: The time at port in the Grand Cayman was short. We paid $5 per person to take a shuttle to the nearby public beach. The water was warm, clear, and refreshing. Drinks nearby cost a fortune, so be prepared. We were in Cozumel, Mexico for about 8 hours. We arranged an excursion through Carnival to go to a nearby all-inclusive, Chankanaab Resort. There they had snorkeling, a Mayan tour, sea-lion show, lots of lounge chairs on the beach, and a swim up bar. Even though this was a self-guided day at the resort, they insisted on giving you an hour-long tour of the place and organizing all sorts of group activities. The guide seemed more concerned with occupying you so you didn't spend too much time at the bar. The resort itself was great, but I'd opt out of this next time. Overall, I think the Carnival Paradise was a great value for the money. Coming up soon will be a post about the travel gadgets you must have on your next cruise! To learn more about travel accessories and to order in time for your next trip, head to our blog at http://thetravelaccessorystore.com/info/blog-posts/.